Why do so many people settle for less than what they really want? Life has always presented challenges and hurdles that can hold us back. We stay in our comfort zone. 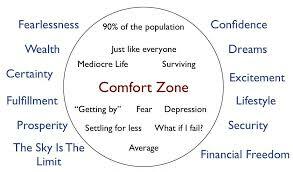 If you read the news or watch it on TV, you hear all the reasons why you should stay in your comfort zone. We have the Ebola virus, terrorism all around the world, the economy is in trouble, and the list goes on and on. We live in a bubble, wanting security from the madness. I say, get out of your own way and begin to do different things. Fear, has a way of crippling you into staying frozen. I have realized that a life worth living is one that I get to step out of my own way, get out of my comfort zone, and give openly. Experiment and experience new things. That’s what being alive means! So LIVE!!! check out my new you tube video from my new book, How May I Serve. This entry was posted on Tuesday, October 7th, 2014 at 11:29 am and is filed under Science of Getting Rich. You can follow any responses to this entry through the RSS 2.0 feed. You can leave a response, or trackback from your own site.